SPOILER ALERT: If you haven’t read Two Sisters of Borneo (Ava Lee # 6), this review includes a major spoiler in the first paragraph about that book and the Ava Lee series in general. King of Shanghai begins about a month after Uncle’s death in Two Sisters of Borneo. Ava is just coming out of grieving and ready to begin a new life as a partner in the Three Sisters investment business she runs with friends May and Amanda. She still feels the loss of Uncle’s mentorship, but is somewhat looking forward to a quieter life, with a steady income and without the violence that resulted from her previous work. Unfortunately for Ava, her old life seems determined to catch up to her. Uncle’s friend and mentee Xu, the head of the Triad in Shanghai, is seeking the chairmanship of all Triad Societies, and he wants to recruit Ava as his adviser. The rest of the story unfolds in classic Ava Lee fashion — other Triad bosses don’t get along with Xu, Ava gets sucked into their conflict, various characters get kidnapped/beaten up/shot. King of Shanghai does focus a bit more on Ava’s strategic thinking rather than her martial arts prowess, which I liked. She ends up having to strategize about the Triad, and that’s a scale beyond what she’s had to deal with in the past, I think. That being said, one of my concerns with this series is that Ava’s always been more than capable so I haven’t really seen much character growth in that regard over the series. Because she has been practically superhuman all along, there was never any doubt that she could come up with a good strategy, nor that she could strong-arm negotiations in her favour. More significantly, there isn’t much difference between the Ava working for Uncle and the Ava left without a mentor. She does mourn Uncle’s death, and there’s a great scene where she dreams about him, but in terms of character development, I didn’t really feel how Uncle’s death changed her in any way. The appeal of any mystery and thriller series is familiarity — there’s a set structure and there’s a certain set of expectations of how the main character would react in a given situation. So in a way, I can’t fault Ian Hamilton for giving us the Ava Lee story we’ve come to expect. I think however that the story arc about Uncle’s health in previous books raised the emotional stakes in such a way that enhanced the series, and that is missing in this book. Ava’s concern over Uncle’s declining health added heart to the series and depth to Ava’s character, and perhaps it is in contrast to that that the language in this book feels oddly detached. Even moments of emotion, such as Ava’s emailing “I love you” to her girlfriend felt clinical in execution, added to the story just to remind us that Ava has a girlfriend before then going on to the business at hand. There is also a subplot about PO, a fashion line the Three Sisters consider investing in. To be honest, I enjoyed that subplot more than the Triad part, mostly because I like fashion, but as the Triad story took off, this story was pushed to the sidelines, and it made me wonder why we spent almost half the book building up this storyline. 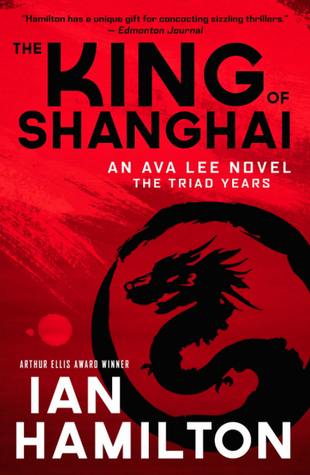 King of Shanghai is a solid addition to the Ava Lee series. If you enjoyed the earlier books, this has many of the elements that make the other books great, and Ava is as powerful and brilliant as ever. Thank you to Anansi for a copy of this book in exchange for an honest review. This entry was posted in Book Reviews and tagged 50BookPledge2015, Anansi, Mystery, Thriller by Jaclyn. Bookmark the permalink.